If you’re like me – a writer with only rudimentary amounts of Web design experience – then you’ve already embraced WordPress with open arms. And, if you’re still like me, there is an aspect of WordPress that gets on your nerves – it is, after all, a dang web platform! Arg, web design is hard! In the past, I’ve outsourced my Web design, which seems to have worked out pretty well, considering I’ve never needed to build a new WordPress design again. But if the Artisteer WordPress theme creator does what it says it will do, I might never need to outsource again. In fact, if Artisteer works, maybe people can pay me to do their design. After feeling my way around the Artisteer software and testing it out, I’ve taken a few screen shots and made this Artisteer review for you. Artisteer starts you out with a nice little beginning template – nothing too fancy, but nothing too WordPress 1.0 either – and the menu is pretty simple. I click through some of the buttons like “Suggest Header” and the heading background suddenly turns into random pictures of skylines and a guy playing a guitar. A nice feature that’s easy to use is the “header” and “column” section of the software, which allows you to easily move around your menus and your columns. For some reason, I never am quite happy with the columns I get in my blogs, so this is a big one for me. You can make both “thin” and “thick” columns just by selecting the basic layout from a menu. I found the options pretty much gave you what you might want – honestly, how many ways are there to build columns, really? Before long, I find myself fiddling with all of the features of the design – sheet width, background gradient, color themes. Artisteer has a pretty intuitive menu and features outline that makes it easy to understand, even for a novice like me. After using their “suggest” features, I hypothesize what a “Leaning on Balls” blog would look like and type in the appropriate headline, as you see highlighted. You can, of course, upload your own images. After choosing a color scheme and basic template, the rest of your design decisions will be affected by it. When you click to edit your button colors, for example, they’ll give you options that fit in the range of the color scheme you’ve already chosen. This takes the “duh” factor out of choosing your colors and making yourself look like a bad designer because you didn’t pay enough attention to the individual colors you were using. Also, at every feature, you’ll find a “suggest” button that will do the work for you. You just keep clicking “suggest” and Artisteer toggles through different colors, schemes, layouts, and headers. Do you think I could come up with a blog about leaning on balls without some help from technology? Please. Though the menu is simple enough, if you want to get into more detail about your blog, you simply click a little arrow in the lower-right section of the part of the menu you’d like to expand. This sounds like something that could use a visual aid. The initial use is simple, but you can easily access more options by clicking the arrows. If you really want to mess with your WordPress blog, you’re going to have to make the big decisions first. The big decisions include the color scheme, header, and general layout of the thing. You can swap where you put your menu (I, in the above pictures, opt for the “above-header” position) and add an extra column. Easy-to-use: Unless you’re one of the people who doesn’t “get computers,” if you’ve used Facebook, there’s a good chance you can use Artisteer. It might take a little support if you’re not sure how to export your theme into an actual WordPress blog, but Artisteer seems to make that process as simple as possible. 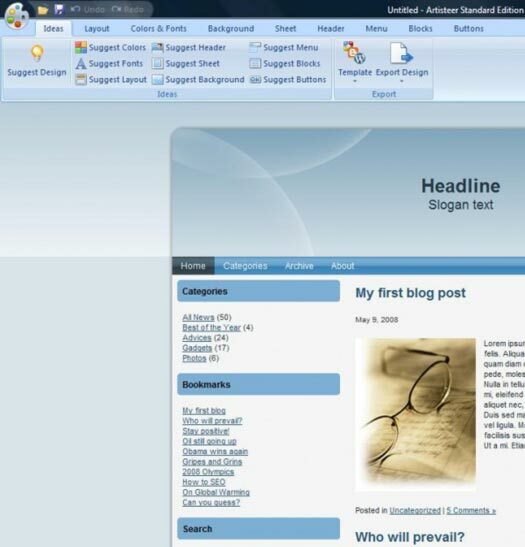 Attention to detail: If you like the basic two-column design of most blogs, you’ll find this software will easily let you customize a large range of details and broad-spectrum ideas. Professional-looking: It’s very easy to come up with a professional-looking site that is unique to your individual blog. Once you make decisions on the big things, the software will then build the rest of your options around those early decisions, making the design flow naturally. Opportunity for creativity: Where is it? Though the software does a good job of allowing you to control a lot of details about your blog, there’s really no space left for outside-the-box design or adding some really freaky widgets. That’s fine if you don’t mind a basic template to serve your utilitarian blog, but the designers looking to push the envelope may not be able to here. As you can see, the positives generally outweigh the negatives in this Artisteer review. I definitely can say I’d recommend Artisteer to someone who was looking to create their own WordPress blog theme, particularly those friends of mine who have no experience publishing much of anything online. You’ll quickly, easily, be able to pick up on how it works and be able to create something that looks better than the Blogger templates you’ll find. For those with more advanced tastes, I can’t say that I have much for you. Of course, you don’t exactly need a program like this, do you? Disclosure: Clickfire received a working copy of the software from the company in order to test and perform the Artisteer review. Artisteer sounds like a cool program to use. Great article. I’m glad you summed up the pos. and neg. it gives me a clear understanding of what to expect from the program. Thanks for this information. I should try the trial version. From the screenshot, it looks that this software is really good. Looks cool. I’m never happy with most templates out there and am always tempted to pay someone to create a unique one for me. I think I’m going to try this out. This tool is marvelous, I’ve just bought a copy. I’m a pretty good webworker (HTML, CSS, PHP …), but a bad designer. This programe is easy to use and does a great design job. It generates standard-compliant WordPress templates and if I want I can still fiddle with the HTML-, CSS- and PHP-code … afterwards. You need to check out version 2 (still beta). 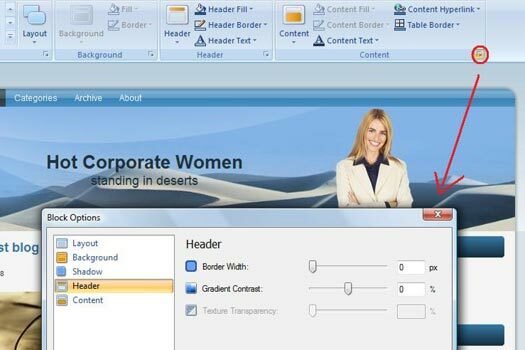 It even allows you to generate templates for Joomla or Drupal! So far I haven’t seen anything like it on the market. The software is very good for decent graphics design but once you get beyond the basic template, one still has to figure out a lot of code to customize some very basic things. It does eliminate a lot of time in putting together the look of your blog, but then if you want to customize the look further, you have to figure out how they are using their code. Good how to use graphics documentation in the manual, pretty lousy documentation on the code they use. Lacks some functionality in very basic look and feel stuff. If you just want to use a very basic blog, this will do a decent job for you and is worth the price. But if you want to begin to customize and add plug-ins, there are some big holes that could be filled. Thumbs up if you want basic functionality with very sweet graphics. Thumbs down if you want to tweak and customize your blog and add additional functionality. That may be the best and most objective review I have read thus far. The lack of customization is being worked on with peer to peer user groups and forums like ours that allow users to share hints, tips, idea and fixes that help overcome some of the limitations of the software. Thanks for the great review! I agree that it’s pretty amazing for what it does, though it does have certain design limitations. However, given the price, that’s to be expected. My problem with it is that the new version seems to be buggy – keeps crashing when I use the color selector. I’ve reported this to Artisteer, but they haven’t responded. That makes me hesitant to get too dependent on their software. i just love this little program! i hate spending hours and hours to find that one theme, and after that spending more to adapt it. and it is only 39 euro! Are there similar apps on the market? I purchased Artisteer and have not been able to customize wordpress themes with additional plug-ins. Whenever you add them the site crashes. I thought something was wrong with the program. Artisteer’s response: it wasn’t designed to be able to do that. diane, I am not sure I follow what you mean by customizing wordpress themes with additional plugins. I installed a theme that I made several months ago and didn’t have any trouble with plugins. Care to elaborate? A very well put together review of a great piece of software. I have created a couple of templates and I have had no issues. I like to design stuff but it would normally take me for ever to come up with just an idea. So Artisteer has helped me save a lot of time. Artisteer is amazing. You can instantly create a wide variety of themes for a many different types of website. Glares, gradients, photos, textures, images, and many more types of media are built in to the software. It also lets you add your own images. I would highly recommend the software. I too was worried about the widgets, I want to put videos on the site. So i emailed them and they said that its just the “theme”, you actually add all the content and fun stuff in the platform or whatever. Also, I personally thought it resembled the new Microsoft Office programs! Dont you think? So basically, anyone who can use excel or word or powerpoint could easily figure this out!! I have used this software to create templates, in Joomla! specifically, and their implementation of z-index in the template caused numerous display issues in Firefox 3.x and IE 6, 7, & 8 when rendering JScook, and Mootools elements. There still is no substitute to hand-coding your design, if you want interoperability, accessibility and SE friendliness. I appreciate your point of view as a non-technical person who needs some look-pretty for your site, but Artisteer aint pretty, it just looks that way. It is good, but not good enough. great, sounds like a good place to start making blogs. i have no experience yet of doing so, so i think i might pick this one up first! thanks for the post! I’ve been testing out the demo and find it very useful and easy to work with. You can’t customize everything, but it does let you work with about 90% of the theme. Adding custom graphics to footers for example seems to be something you would need to do by hand. However, you can easily change the colors, size and graphics of a theme in just a few minutes. It’s a little pricey but the program seems worth it if you have few blogs you want to work with. I want to thank you for this informative article. I have been battling to create a good looking template for my website and I will try the trial version and see how simple it is. I am a newbie and couldn’t be happier. Thanks for the post after a few minutes on the trial I new i needed this program. Thesis theme is a better option. It was great discover for me and I used it for majority of my sites since. Not for all because the look of site designed with Artisteer can be spoted quickly. There should be more variety of layout design. This is also one of few things on my wish list besides more menu options, modules in header position (especially search module). I think Artisteer has great potential, look forward to next versions. Artisteer is a good program for those wanting something ‘different’ in their theme that they can’t seem to find anywhere else as well as those seeking to create their own ‘look’. It’s an easy to grasp program with intuitive suggestions and options like Emory reported above. I’ve been using it on and off for a year now and have been satisfied with the results myself. My take on it is that professionals create options galore with their templates and custom coding whereas, Artisteer allows it’s owner to create unique templates that they can customize to suit their tastes. I’ve only used mine for creating WordPress themes and some HTML templates and have had a good bit of success with it. However, I still find myself going back to others from time to time. Guess it’s all in how well satisfied one is with the end result. Overall, it’s a good program for the novice to intermediate designer that will net them good results. I tend to agree with your assessment, Scott. Taken for what it is, Artisteer gives you a way to quickly put together a decent looking theme with basic features and without spending a large sum of cash. Oh, and by the way, those who complain about the IE6 browsers still being used? Forget about them. Between the security risks and incompatibility issues, they’ll be forced to upgrade in the near future. The program is in many ways better than Thesis or Headway, which I’ve used, but it doesn’t let you add or edit Content, which is what blogging is about. Is there a way to drop text, links,images or video into sidebars, headers or blogs? It is not supposed to be to enter content but to create a template. You add a content later within a selected CMS like WordPress. Thanks for the heads up, I am looking for something like this. I’m glad you made the point about it not being creative. I’ve looked at some other theme designers and they are the same boxy, standard, classic, boring styles. However, I think this is a beginning, these tools will get better. The biggest contender though is the new themes which have dynamic style sheets like Flexibility2 and the superb Atahualpa. The latter one of these themes has amazing tweakability (my new word) and once you get over the shock of the options available it’s actually very good. Personally, I want a desktop theme designer which delivers for someone with some programming experience without being a professional. I bought the standard version (not the home version) of Artisteer and whilst I initially had a lot of fun with it, it’s limitations soon began to surface. In order to get anything other than the very standard look and feel of these generated templates, you need to dig into the code/CSS. If you are going to be doing that anyway you may as well consider the amazing (and free) Atahualpa theme which has much greater flexibility. Artisteer is great! After you design your desired template you can alter the images or replace by using any photo/imaging software -like photoshop. So, the issue of creativity is a lesser factor than the article posts. However, beyond that, if you try to tamper with the html code, you will find that the template is laced with rigid code rules regarding layout. For example, if you want to create a php table (the default html code with which the templates are rendered) you will find that table cells are set to 33%, in order to accommodate the three column table cell layout the program offers. If you try to add to the css to create new table rules you find that, without really deep coding experience, you will very quickly run into problems. It is a great program because these problems do not really spill into the CMS exports (wordpress, joomla, ect.) however if you are creating html templates with the idea of altering them in your favorite software (ie dreamweaver, kompozer, ect.) you will use as much energy wrestling with the code, as if you had built your site from the ground up. yeah artisteer is great software to create unique templates or themes for my blog, altough i don’t understand about php, css or ajax. Tough choice: customize an existing theme or create from scratch. I think Artisteer would be good if you needed to create several sites quickly. The review, the comments are good. But I find something amiss in both: the faded look the program has. All graphics, text, screen colors look faded. Please do not get offended but the websites launched using Artisteer too look the same. Obviously the new developers can’t be blamed. But I wonder that when all instructions are read by the servers, how come they interpret differently for sites from Artisteer? I can understand that to shorten loading time, low-resolution images may be the solution. But what about the logos out there: Google, Twitter and … I felt the same when looked at the free programs on Linux: unprofessional, faded, half-baked types. There the problem is that everything is free and we can’t openly blame those efforts. But Artisteer is paid app and on-screen, at least, should look crisp and inviting, which it fails on. I would like to know your views. Happy New Year to all readers! I’m not seeing the faded effect you mentioned. There are definitely Artisteer signatures that can be picked up both visually and by search engines. I’ve seen some pretty nice looking Artisteer themes, but I guess it’s like anything else, the more you put in the design, the more you get out of it. IMHO, Artisteer’s strength is not so much aesthetics, but getting themes live fast. Not especially, but as SEO friendly as your typical every day WordPress theme, I’d say. Question: I purchased Artisteer and love the program but once I export to wordpress, my theme does not look the same? The article part is not showing? Gina, I’m not sure. You may want to open a support ticket at artisteer.com. Anyone else have ideas? I tested Artisteer and find out that you can create a website or blog in a record time but with some limitatios when you want your blog to be even more personalized. By a near price i prefer using thesis theme, but you need to learn some css and php code, and with some time of practicing you can do almost what ever you want with that theme. Athena.. if you really think artisteer is complicated, than you might not want to get involved in webdesign anyway. Artisteer is the easy part. I made my way through a lot of WordPress theme generators and although Artisteer exceeds most of them, I can say I am not happy with it either. It’s great if you are a beginner when it comes to web design, you can easily make use of your editing options, but as a beginner, I wouldn’t pay the money. I’d rather pay a web designer instead and save me the trouble of fixing compatibility and design problems, or use free online web generators, which can make my work much easier and fun. Lubith for example is a great editor, very flexible and dynamic. You can select/move/resize/edit properties of all the elements of the layout, test/download/use your wordpress themes in no time. There’s definitely something to be said for paying a professional web designer if you have the budget. I’ll check out Lubith, looks interesting.